Kerala Cuisine is full of flavours since the state of Kerala is the spice bowl of India and the world for centuries. Many Europeans and the British landed in this southern west coast searching for spices. They found more than what they expected: many spices like cardamom, clove, black pepper, cinnamon were found here in abundance. And they all fell in love with Kerala and its Cuisine. The beautiful backwaters and sunny beaches of Kerala host many coconut groves. It’s a holiday destination for many Indians and now a popular tourist place for westerns after Goa in India. Kerala cuisine is influenced by it’s lengthy coastline and coconut groves alongside. The backwaters and coastal villages provide plenty of seafood supply and the cooking is inspired by coconut as main ingredient. Kerala is also well known for the spice trade for centuries. The quality local grown spices, extracts of coconut trees and fresh seafood create a perfect setting for tasty and enjoying cuisine. It’s not too hard to cook Kerala dishes back in the kitchens of UK as most of the exotic ingredients are readily available in our supermarkets throughout the country here. Go on, give it try and see how cooking Kerala recipes at home makes feel so good! Although the ingredients and preparation seem to be same as a normal Papadam, Kerala variety is subtle different since it uses locally grown pepper as main flavouring. 1. Mix urad dal flour, baking soda and salt with ¼ cup of water to make a thick and smooth dough. Add roughly ground black pepper. 2. Divide the dough into one inch diameter balls and roll out with a rolling pin such that the Papadam is around 5 to 6 inch circular discs. 3. 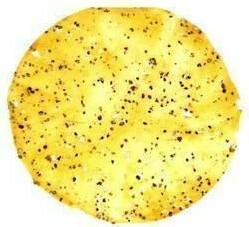 Dry each Pappadam in the sun or in an oven that is heated to 175 degrees. When dry they are ready to be fried or roasted. 4. To cook the Pappadams, head about 3 cups of oil in a large pan to a very high temperature. When the oil starts smoking, cook the Pappadams one by one. They will expand and bubble then remove them from the oil when they turn light brown. Parippu in Malayalam means Dal or Lentil, these tasty patties are very popular roadside snack thought out the state of Kerala. Soak the dals in water for at least 2 hrs. Drain all the water, use kitchen towel to dry if required. Grind dals coarse (like crushed not a smooth paste). Do not add water while grinding. Add chopped onions, curry leaves, green chillies, ginger, chilly powder, salt and mix well. Wet your hands and make one inch dia balls of the mix. Serve hot with mint or mango chutneys. Boil eggs, once shell removed, cut into 2 vertical slices. Preheat the oven at gas mark 4 at 175 deg C.
Cut the pastry sheets 4 inch square and sprinkle a pinch of each powder (Red chilli and Garam Masala). Place the boiled egg half upside down over the sprinkled mix. Now grind the black peppers over the egg or pour a pinch of crushed black peppers. Close the corners of of square pastry over the boiled egg piece and seal using the egg white using a brush. Garnish with coriander or spring onion and serve. 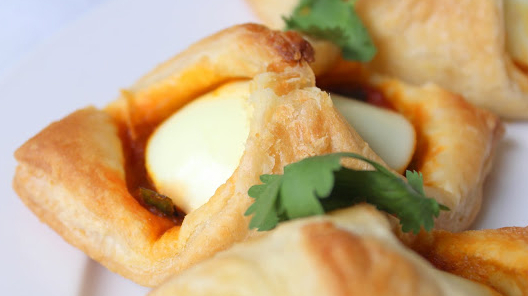 A great break time snack or a starter for a lovely curry night! Using besan flour, rice flour and baking soda and water as needed make a thick batter. Add chilli powder, Coriander powder, turmeric powder and salt to the batter and mix well. Now slit the green chillies lengthwise to half the depth so that the chilli stays as one piece. Remove the seeds to control the heat (or hotness) and sprinkele salt, coriander poweder in the slit. Heat coconut oil in a frying pan. When the oil becomes hot, dip slit chiliies in to the batter and coat it evenly with the thick batter. Slowly place chiliies one by one into the hot oil pan and fry so that it evenly cooked. Take out the fried chillies and drain in a kitchen towel. Garnish with coriander leaves and flinely chopped onions. These mulaku bajjis are a great companion with Chai! Sunflower Oil – 1 tbsp. Grind the coconut with the chilli,turmeric and corriander powders and make a paste. Heat the oil in a pan, add mustard seeds, cumin seeds. After these splutter, add add onions, green chillies and curry leaves. Pour the paste made of coconut and cook for over five minutes stirring so that it does not burn. Add now cocnut milk and tamarind juice that is squeezed out of the soaked tamarind. Cook slowly till the mixture becomes thick and boiling. Add one cup water and boil for another five minutes. Once the mixture cooked nicely, slowly place the fish steaks into the boiling mixture. Simmer slowly till the fish cooked well. Garnish with chopped fresh coriander leaves. Enjoy with plain boiled rice! • Kerala, also known as Keralam, is a state in the south-west region of India on the Malabar Coast is one of the most popular tourist destinations in the country. 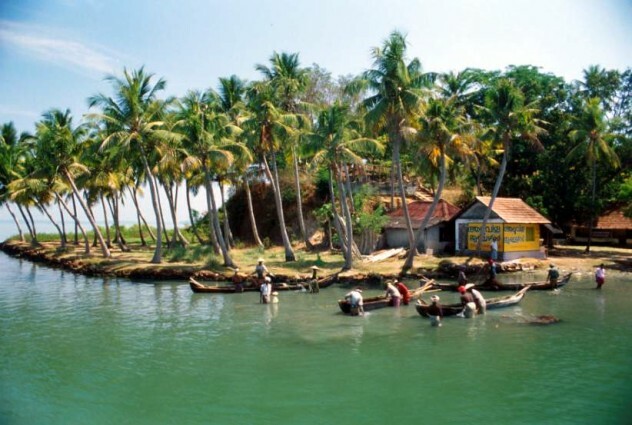 Kerala is famous especially for its ecotourism initiatives and beautiful backwaters. • Its unique culture and traditions, coupled with its varied demography, have made Kerala one of the most popular tourist destinations in the world. Kerala state is divided into 14 districts with the capital being Thiruvananthapuram. • Malayalam is the most widely spoken and official language of the state. The tag line Kerala – God’s Own Country was adopted in its tourism promotions and became a global super brand. Kerala is regarded as one of the destinations with the highest brand recall. Kerala is known as the “Land of Spices” because it traded spices to Europe. Kerala cuisine offers a multitude of both vegetarian and meat dishes prepared using fish, poultry and red meat with rice a typical accompaniment. Chillies, curry leaves, mustard seeds, tamarind and asafoetida are all frequently used. Food is traditionally served on a banana leaf and almost every dish has coconut and spices added for flavour, giving its cuisine a sharp pungency that is heightened with the use of tamarind. Seafood is the main diet in coastal Kerala, whereas vegetables are the main diet on the plains. Meat is served as the main course in tribal and northern Kerala. The major festival in Kerala is Onam. The festival falls during the Malayalam month of Chingam (Aug – Sep) and marks the commemoration of the homecoming of the mythical King Mahabali who Malayalees consider as their King during pre-Vedic period. Some are of the opinion that Onam is reminiscent of Kerala’s glorious agrarian past, as it is considered to be an affluent harvest festival. 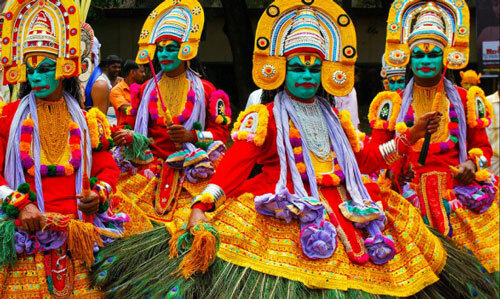 Kerala has a number of religious festivals. Thrissur Pooram and Chettikulangara Bharani are the major temple festivals in Kerala. The Thrissur Pooram is conducted at the Vadakumnathan temple, Thrissur. The Chettikulangara Bharani is another major attraction. The festival is conducted at the Chettikulangara temple near Mavelikkara. The Sivarathri is also an important festival in Kerala. This festival is mainly celebrated in Aluva Temple and Padanilam Parabrahma Temple. Padanilam Temple is situated in Alappuzha district of Kerala, about 16 kilometres (9.9 mi) from Mavelikkara town.